It was rather warm outside and inside but she settled for inside. She had a bacon cheeseburger which she said wasn’t too bad. 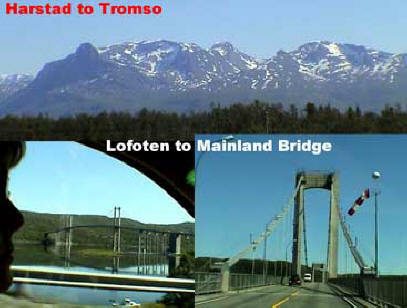 I worked a little on the computer and then we left and I drove north the remaining 86 miles arriving in Tromsø at 7:15. The scenery was also quite spectacular along this run. I got some shots of the speed radar cameras (below right) that are out to catch us. We are 186 miles north of the Arctic Circle and north of Alaska which I didn’t believe until I looked at a globe the next day. 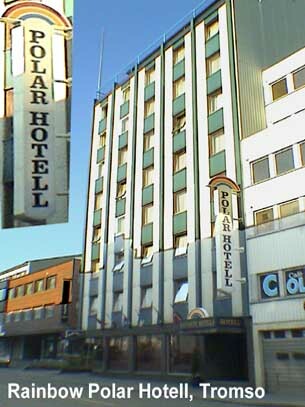 We pulled into downtown Tromsø and found the hotel I had booked the day before, the TIR Polar Hotell [Grønnegata, +47-7-775-1710] (left) but the entrance was right on the street with no place to pull up and unload your bags. I drove a little further down and pulled into the lot of a company that was closed, and proceeded to get all our bags out. We rolled them to the hotel and checked in. We unpacked and then got a call from Dr. Aleks Stojanovic, an ophthalmologist who lives here. My close friend from high school, Dr. Jim Pulaski had met him at an eye surgery meeting and told me he was a great guy and that I should contact him when in Tromsø. 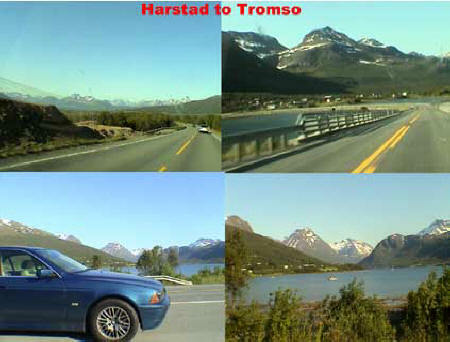 I had several email correspondences with him before we left home asking him about the quality of the roads in northern Norway. I had called him earlier and he said he would call me when we arrived. Aleks told me he would pick us up for dinner at 8:30. We had a few minutes, so while Marcia changed, I decided to find a place for a cappuccino. First I went to move the car to the hotel parking lot across the street and I find a parking ticket on it because it was in a reserved area. 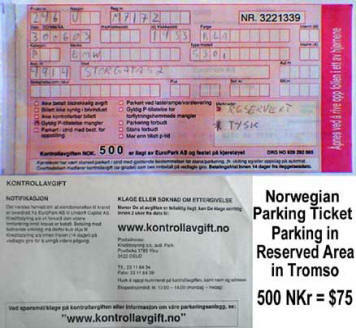 The ticket was for 500 NKr which is about $75. I saved it to photograph and store in my European ticket collection. After parking the car, I found the Meieriet Café [, +47-] just down the street on the corner. 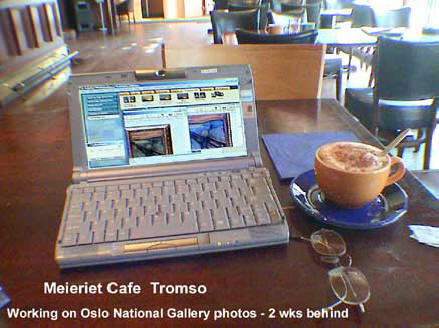 I worked on photos on the computer and the cappuccino was excellent. I got back to the hotel just in time for Aleks to pick us up. We met his wife Dagny and they drove us to the restaurant. It was a picturesque large white building right on the water in the harbor area called Arcta. 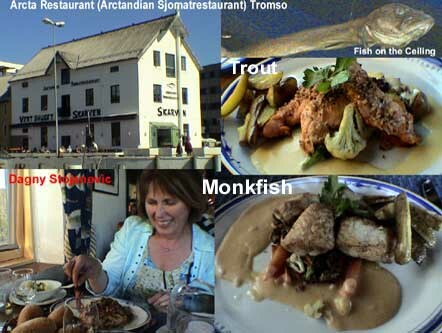 The restaurant is called Arctandian Sjomatrestaurant (right) [Strandtorget 1, +47-9-069-3319.] For some reason they had these large dried fish hanging from the ceiling. 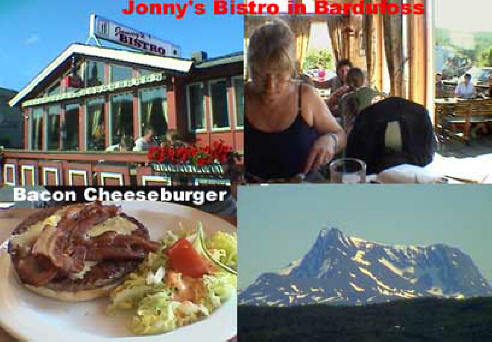 Marcia and Dagny had fresh Monkfish while Aleks and I had trout. Three of us enjoyed some Italian white wine as well. The food was fairly good. 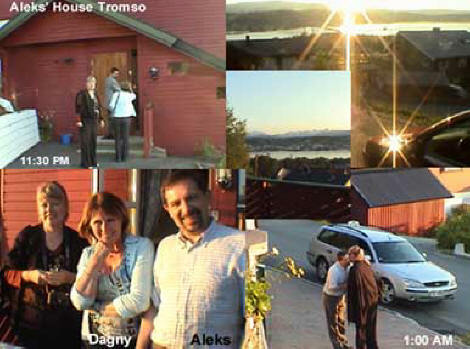 I decided to treat because they were inviting us to their house for dessert and to watch the midnight sun. Aleks told us that he is originally from Serbia (then Yugoslavia) and met Dagny when he was here for education. 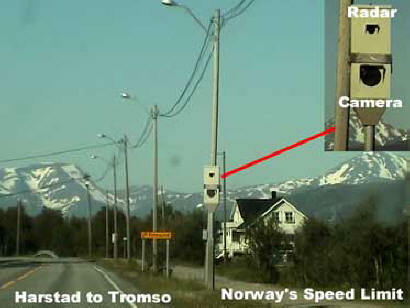 They married and settled in Tromsø and he loves it here. We told them how we had our honeymoon in Yugoslavia and enjoyed it very much. After dinner Marcia and I caught a taxi (because of the DUI laws) and followed them to their house at 11:00 (Aleks refrained from the wine.) Dagny prepared some fresh fruit desserts and we opened a bottle of champagne to watch the midnight sun from his side porch. 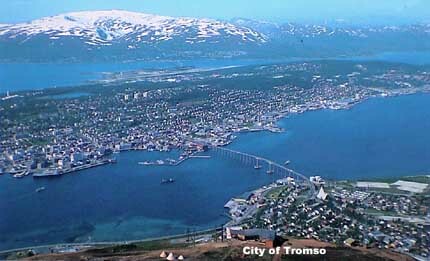 His house is high up on the hill across the Tromsø-sund from the main part of town which sits on an island. I enjoyed their little Chihuahua dog but he kept wanting to bite me. 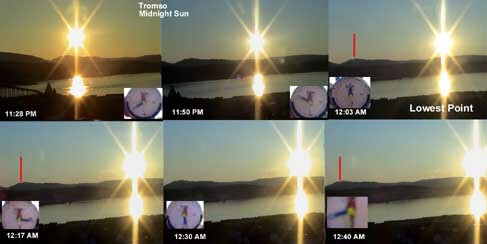 We set our cameras on the ledge and started taking pictures and video as the sun slowly sank toward the hills. It was spectacular watching it end its downward movement and then begin to head back up in the sky as midnight passed (collage below.) I asked Aleks and Dagny how they could stand the six weeks of total darkness in the winter when the sun never rises. They told me they get used to it. Hard to believe. By 1 AM it was almost daylight again and time for us to go. Aleks called a cab for us and our ride back took us past the Arctic Ocean Cathedral (Ishavskatedralen,) which was designed by Jan Hovig in 1965 and over the beautiful suspension bridge (Tromsøbrua) back to our hotel. The gal on the night desk was nice and let me do AOL email while Marcia went up to bed. I was able to book my hotel reservations for the American Academy of Ophthalmology meeting in Anaheim in the fall. I finally got to bed at 3 AM.